Sandy television transmitter started broadcasting ITV (Anglia) on the VHF band in 1966. By 1969 BBC2 had been added (on UHF) and this was extended to BBC1 and ITV in 1971. It switched over to purely digital transmissions in 2011. The mast is about 240m high and it may be some way shorter than Belmont at 385m (as originally built) but it`s still around the same height as Canary Wharf ! Which begs the question, how high is high ? One of the best views of the transmitter can be had from the East Coast Mainline railway which runs just over a mile to the West. You might not have that long to see it though as the express trains here are usually travelling at about 125 mph, which is rather faster than they were doing when the line was first built by the Great Northern Railway in 1850 ! Good views are also possible from the A1 the transmitter being about about 3 miles to the East of it. There are plans to build yet another bypass on the A1, and this is to bypass the original bypass, which was built to divert traffic off London Rd in Sandy. Just to put that into perspective, apparently the A1`s junction in Sandy was still traffic light controlled as late as the 1970s ! The transmitter is situated 10 miles East of Bedford, just next to the town of, unsurprisingly, Sandy. Sandy broadcasts to about 2 million people including areas of North London plus Bedford, Peterborough, Milton Keynes, Cambridge and Stevenage plus many other towns in the counties just north of our capital. The transmitter has three smaller repeaters to increase its signal coverage. The fact Sandy only has three repeaters is due to the relatively flat nature of the country in the transmitter`s coverage area, which also partly explains why the site is at only 55m (above sea level) which must be one of the lowest for a main transmitter. How High Is High ? 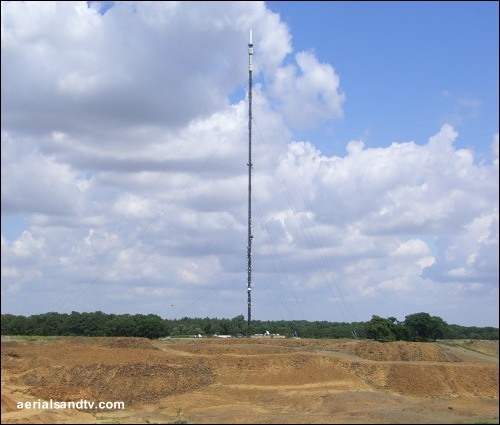 The fella on the Sandy Heath transmitter is at about 75m. If you fell from there you`d get more than a grazed knee. There`s another 165m of the mast above him. If the chap working on Sandy dropped his spanner from where he is it`d take about four seconds to hit the ground, and if he dropped it from the top it`d take seven seconds. to scale on the right. Incidentally, something dropped from the top of Belmont would take about nine seconds to hit the ground, and would be travelling at about 195 mph. And if that hit you, it would give you a really bad headache. The above transmission powers make Sandy the fifth most powerful transmitter in the UK. Note the huge increase in power after the 2011 digital switchover. Sandy Heath is horizontally polarised and was originally an A group (when it just transmitted analogue), but since digital it has now become (effectively) a K group. 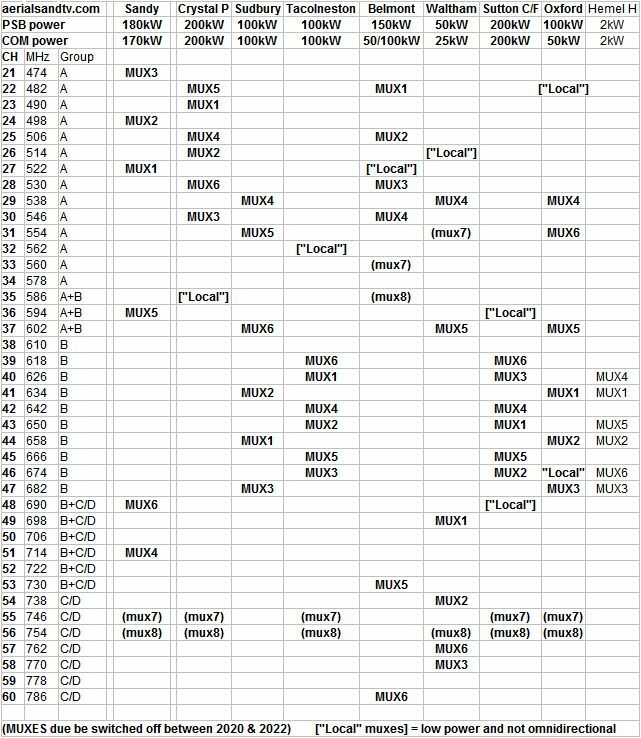 There is one ”Local” MUX allocated to Sandy, CH42, which may be used for a local Bedford TV station, but probably not…... All the aforementioned channels can be picked up by K group aerials. 700MHz clearance occurred at Sandy in June 2018, but the transmitter remained a K group on CHs 21 to 48 (excl MUXES 7 & 8). will be out of the A group (excl MUXES 7 & 8)…. 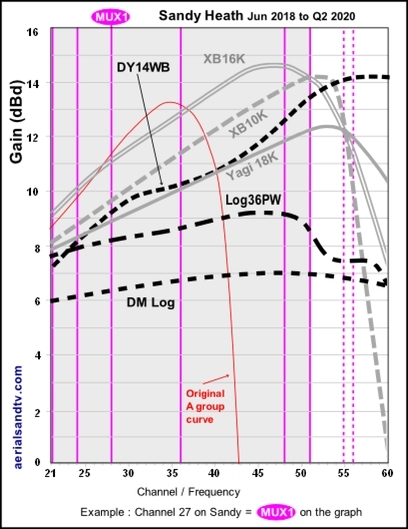 It can be seen from the graph that the three PSB MUXES can still be received on an “original” A group aerial, and after the second Q 2020 only MUX5 will be out of the A group (excluding MUX 7 & 8). How high is high ? ! ? For Sandy we recommend the DM log for strong signal areas, the Log36 for medium signal areas, and the Yagi18K or XB10K for poor signal areas, the latter aerial being particularly well suited to loft mounting. 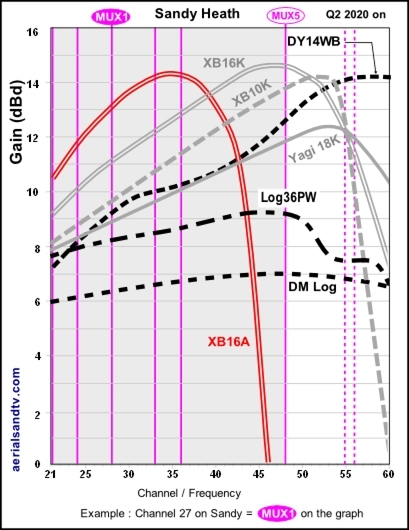 The XB16K is for those with the most marginal signals. The dimensions and test performance of the aerials can be found on the relevant tables. anyone who really requires a “high gain” aerial on a K group transmitter, e.g. Sandy, should actually fit a K group ! The guide below also includes the same information for some of the other transmitters in Sandy`s coverage area, namely Crystal Palace, Sudbury, Tacolneston, Belmont, Waltham, Sutton Coldfield, Oxford, Hemel Hempstead and Hertford. The channel allocation guides can be very useful in the diagnosis of co-channel interference problems and can also be invaluable if you are trying to find a spare channel for a modulated output (e.g. for a Sky box or CCTV system) to be added to your TV setup/distribution system without suffering from co-channel. Those situated to the north and/or west of Sandy may find that during certain weather condition they can suffer from additional co-channel as their aerials are pointing towards the continent. Also check Sandy`s three smaller repeaters, though I wouldn`t have thought there`d be many people on them ! The frequencies given are for (most) digital MUXES, for analogue channels deduct 3MHz. 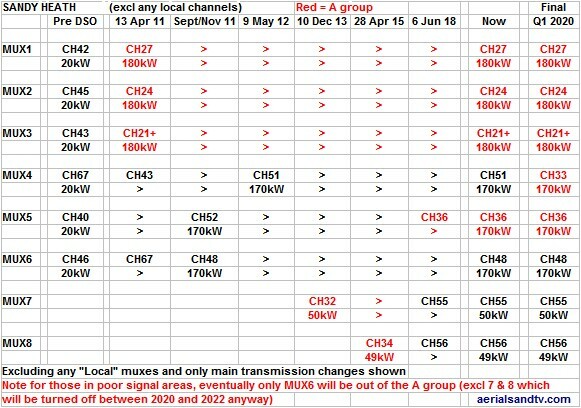 For those in poor signal areas it should be noted that, after the second quarter 2020 only MUX5 * will be out of the A group. * excluding MUX 7 & 8 which are due to be switched off between 2020 & 2022 anyway….